Investing in a motorcycle is a big decision for anyone, but Yamaha’s unparalleled reputation for performance and superior handling makes them a clear choice for all sorts of riders. 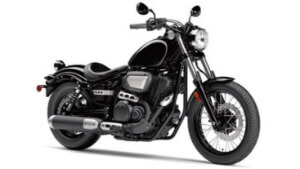 Whether you are in the market for your first motorcycle or you are ready to trade up for a new model, it is important to research new and past motorcycle models before making a final decision. In this Yamaha motorcycle buying guide, we explore all the accessories, specifications, and features you can expect from the latest Yamaha lineup. Yamaha’s lineup of supersport motorcycles delivers the pinnacle of performance both on and off the track. A supersport motorcycle is light, nimble, and close in capability to its racing counterpart, with a powerful engine to boot. Yamaha offers a variety of superbike styles to choose from, including options for canyon carvers and commuters. Simply put, sports bikes are built for speed and they aren’t shy about it. Although they are incredibly fun and exhilarating to ride, sports bikes are not the best choice for beginners. MT motorcycles employ a crossplane philosophy to provide strong, linear torque and guarantee outstanding economy. The Hyper Naked lineup feature three distinct models, each aggressively styled to celebrate the vibrant sub-culture of the Japanese underground. This iconic lineup pays homage to Yamaha’s rich heritage while focusing on futuristic performance. Whether you are looking for light and nimble or fly-by-wire throttle, Yamaha has all your needs covered with an array of sporty classics and high-performance bobbers, with retro styling and unrelenting power paired with perfectly controllable acceleration. Striking the perfect balance between comfort and outstanding sport performance, Yamaha’s Sport Touring lineup provides a world of opportunity for a wide range of riders. These long-distance motorcycles are perfect for commuting to work or crossing the continent with a passenger and your luggage, making memories to last a lifetime. Among the most romantic of available models, cruisers and touring motorcycles are a top choice amongst biker types and all kinds of riders. Cruisers are ideal for beginners, because they allow you to sit low, give you more control, and are easy to ride for long distances. Yamaha offers a variety of new models to choose from in every size category, but each model exudes an old-school attitude with an emphasis on mechanical beauty and that authentic V-twin feeling. Adventure is practically embedded within the DNA of some riders. Yamaha’s Adventure Touring lineup features a variety of compact touring motorcycles that are built for long distances and exploring beyond the pavement. Dual-sport motorcycles are also perfect for traveling on and off the road. If you want the pleasure of riding around town and getting into the backcountry, an adventure touring or a dual-sport motorcycle may be the ideal choice for you. Whether you are shopping on a tight budget or you are simply not ready to handle such a large engine at top speeds, a scooter offers an excellent alternative to the traditional motorcycle. Scooters are typically more fuel-efficient, affordable, maneuverable, and easy to maintain, making them a good choice for urban commuters. Yamaha offers a wide variety of styles to suit any preference, ranging from classic to modern and sporty to sophisticated. Motocross bikes may not be street-legal, but they come with all the latest technology and performance features designed to make off-roading enthusiasts the best riders possible. Some of Yamaha’s off-road competition models in the Motocross lineup feature push-button electric start as well as the Power Tuner app to make timing changes instantly. Looking for a trail machine that can stand up to all the backcountry adventures you take with your buddies? Yamaha’s Cross Country lineup is filled with lightweight yet powerful motorcycles that are expertly engineered to tackle any terrain and provide great handling in tough trail sections. You can expect new engines, optimized ergonomics, and much more. There’s nothing quite like riding the trail with family members, friends, or fellow enthusiasts. Yamaha’s Off-Road Recreation lineup features light, simple, and proven trail bikes that deliver on decades of low maintenance and uncompromising performance. With electric start and automatic transmission make these off-roading bikes the perfect choice for beginners and little riders alike. Hopefully this Yamaha motorcycle buying guide gives you a great idea of the street bikes and trail machines you can expect to see on the market this year and beyond. When looking at Yamaha’s long and celebrated history in motorcycling and the sport of motocross, it’s easy to see why this brand has earned a loyal following of riders across the globe. Please feel free to contact us if you have any questions about this guide or our selection of Yamaha 2019 motorcycle OEM parts today.